This is one of those recipes that I don't remember where it came from, but it has been one of my favorites for years and years. I have a few of those types of recipes lying around. For most of them I try to scribble down what website or friend I got them from, but this one is a lost cause. But at least the recipe itself is not lost because this is one of my favorite desserts! 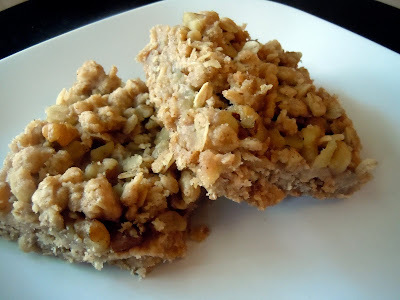 These bars have a really nice crust, but a soft center from the applesauce. The walnuts on top give it a little crunch as well. 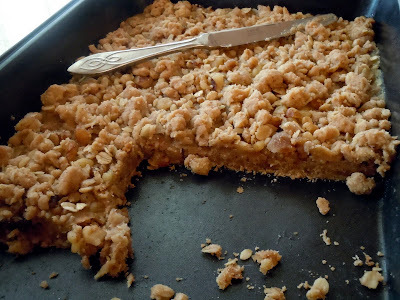 All in all, the combination of crunchy and soft is fantastic and they taste amazing. Grab yourself a tall glass of milk and make yourself a batch of these as soon as possible! They won't disappoint! In large bowl, combine all ingredients except applesauce and walnuts. Mix until crumbly. Reserve 1 cup oats mixture. Press remaining oats mixture onto bottom of a greased 9x13 inch pan. Bake 13-15 minutes; cool. Spread applesauce over partially baked crust; sprinkle with nuts. Sprinkle reserved 1 cup oats mixture over top. Bake 13-15 minutes or until golden brown. Cool in pan; cut into squares.